We tend to think of materials as either electrical conductors or insulators: some materials, like metals, have low electrical resistance and conduct electricity easily, while others, like wood or plastic, have high electrical resistance and do not readily conduct electricity. Strange experimental results, however, reveal large fluctuations in the electrical resistance of thin metallic nanowires when a magnetic field or charge difference is applied to them. Click to learn how a more nuanced understanding of electron behavior helps to explain these variations in electrical resistance that may revolutionize the tech industry! You may know helium as the gas that can make balloons and blimps float. 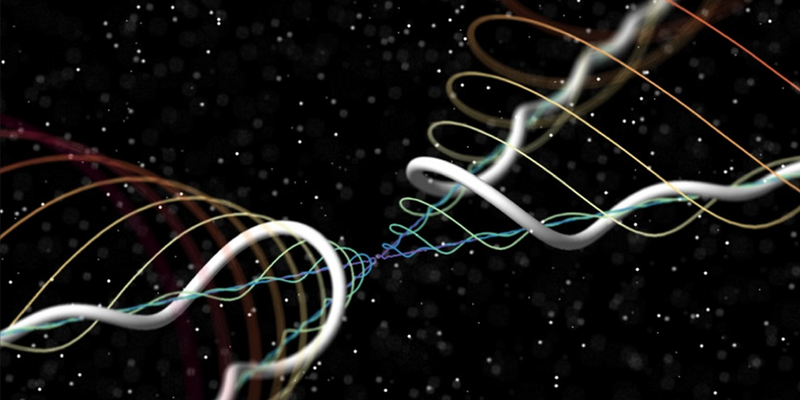 At the University of Maryland, scientists are using this element to study the exotic physics of quantum vortices: the tornadoes or bathtub-drain whirls of the quantum world. Knowing how quantum vortices work could help us better understand other turbulent events (like wind and ocean currents), as well as the complex physical behavior of superconductors and neutron stars.